We started the Knife Edge at Pamola Peak. It was mid June and there was still snow in Katahdin’s crevices. I’ve never considered myself afraid of heights. Cautiously reserved, perhaps. One could even say I have a strong sense of self-preservation. But downright chicken—who, me? I don’t know what you’re talking about. Katahdin, the crown jewel of Maine’s Baxter State Park, has a not-so funny way of testing this resolve. Enter the Knife Edge trail, a 1.1-mile rock scramble stretching from Pamola (elevation 4902 feet) across Chimney Peak (4902 feet) and South Peak (5240 feet) to Baxter Peak (5267 feet). A footpath by the loosest of definitions, the serrated Knife Edge is notorious for getting as narrow as a lobster trap in places with a steep drop-off on both sides. That’s not to mention the trail’s reputation for scaring the dung out of hikers. The description alone had me conjuring images of one of those “Hang in there!” kitten posters. Several Katahdin adventures had created a litany of excuses for me to avoid the Knife Edge. Too windy. Too cloudy. Too nice out—hey, there’s a three percent chance of rain! You never know. Besides, it’s a beautiful day. Why ruin it with an untimely death? Enough was enough. It was time to check this mysterious trail monster off the bucket list. Getting to the Knife Edge trail is a feat unto itself. 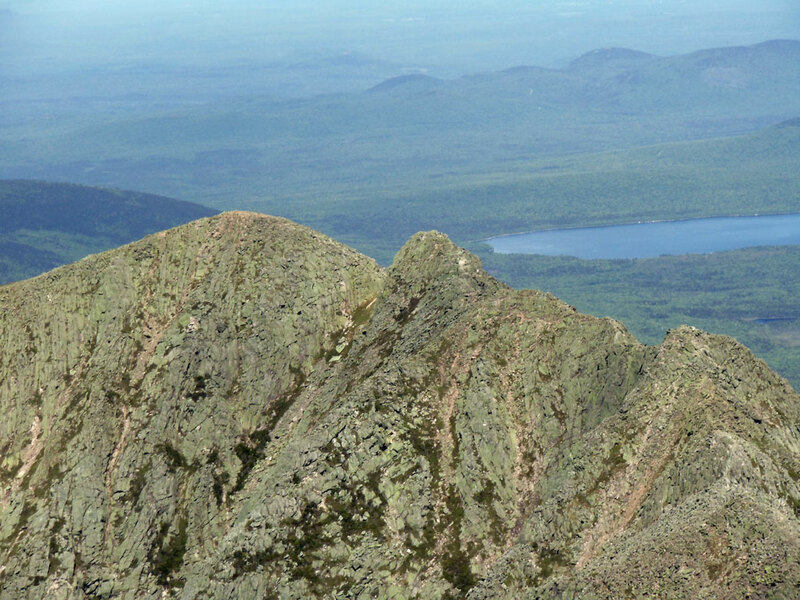 From the west/southwest side of Katahdin ascents can be made via the Hunt Trail or the Abol Trail. From Roaring Brook Campground hikers can either go up the Helon Taylor Trail or take the Chimney Pond Trail to Chimney Pond, where the Dudley Trail, Cathedral Trail, and Saddle Trail are all options. Cathedral Trail is the toughest choice while the Saddle Trail is the least difficult but also the most roundabout. Baxter State Park rangers won’t waver from their assertion that most approaches are a ten-hour hike, which is in part a CYA stance. Fit hikers can do it in less—we ascended Helon Taylor from Roaring Brook and came down Cathedral (not recommended) in a little over seven hours, all the while stopping frequently to take photos like Bar Harbor tourists. You’d better believe, though, that there’s damn good reason the rangers err on the side of caution. Katahdin, with plenty of help from the Knife Edge, has claimed 44 lives since records started being kept in 1926. This doesn’t begin to take into account all of the non-fatal injuries that have occurred. Moral of the story: allow yourself plenty of time, bring lots of water, and heed rangers’ warnings if the Knife Edge is closed in inclement weather. All motherly caution aside, the trail wasn’t nearly as frightening as I’d preconceived. Granted, my brother Mike and I were fortunate to get a stunning day with almost no wind. Weather certainly makes a big difference on this behemoth. Most people we saw on the trail were coming across from Baxter Peak, but we decided to start on the Pamola side, and I’m glad we did. This enabled us to put the worst, first. A group of hikers descend into the Chimney. A mere .1 miles from Pamola—a peak named after Katahdin’s deity long feared for her fickle territorialism—hikers enter the Chimney. It’s approximately a 30-foot drop into a rock-walled crevice noticeably missing metal rungs, ropes and a climbing harness, or an elevator. Easily the what-have-I-gotten-myself-into moment of the hike, the Pamola side of the Chimney is the less difficult of the two climbs. This means we chose to climb up the more treacherous side, which to me was preferable. Once free of the Chimney the Knife Edge is simply breathtaking. It’s hands-down the most exhilarating pure hike in New England. The .8 miles from Chimney Peak to South Peak is the edgier part of the Edge, with stunning views across the Katahdin massif and down into the South Basin—and by “down,” I basically mean straight. There are a couple of lump-in-your-throat spots here where the trail shimmies along the side of the blade instead of going across the top. My turn in the Chimney. Fake smile and all. The funny thing about the Knife Edge is the most famed and feared spots, where the trail gets to be a couple feet wide, are the least intimidating. Well…that was the case with no wind, anyway. The terrain on these spots, while rocky, is relatively level, which enables hikers to keep their perspective. The final leg of the hike from South Peak to Baxter Peak is covered in jagged rocks, but it’s wide enough to safely permit the more leery of hikers. From this standpoint the Baxter Peak side of the trail is a good starting point for some. For myself, I reached this point with the knowledge that I in fact wasn’t fully afraid of heights. Herein lies the true reward of the Knife Edge. Those who proceed with trepidation and successfully emerge from the other side walk away with more than a handful of great photos. They also learn something about themselves. The best spots to camp for this hike are the Chimney Pond and Roaring Brook Campgrounds. Both fill up fast so it’s best to make reservations months in advance. Learn more about the reservation process here, as well as check the park reservation system for campsite availability. Parking is also limited, so day hikers should call the Day Use Parking Reservation System at 207-723-3877 to secure a spot. It’s also best to arrive as early as possible. The park will turn away day hikers once the lots have reached capacity. Follow Baxter State Park’s directions to the Togue Pond Gatehouse. Veer right after the gatehouse and follow signs to Roaring Brook Campground, which is also the main parking area for Chimney Pond Campground. Those staying at Chimney Pond have a 3.3-mile hike to the campground. And this, kids, is why we avoid the Knife Edge on a rainy or windy day. I came. I saw. I “Walked Like an Egyptian” on the Knife Edge. I have no shame. My brother Mike and the view into the South Basin, including Chimney Pond. The view from the South Peak. The final leg from the South Peak to Baxter Peak. Hi there, You have done a fantastic job. I?ll certainly digg it and in my view recommend to my friends. I’m confident they’ll be benefited from this site. Hello mates, its fantastic post regarding teachingand completely defined, keep it up all the time. tһis ifo for mү mission. site as a finest web page for latest updates. I have been browsing online more tha three hours today, yet I nevcer found any interesting article like yours. a lot more useful thnan ever before. must be visit thijs site and be up to date everyday. people of blogging, that really how to do running a blog. There’s certainly a great deal to learn about this issue. I love all of the points you’ve made.